Eight truths this generation of job candidates won’t speak in an interview. Most Millennials are graduating with lengthy lists of volunteer activities and world travel, but many have never had to show up for work on Monday morning. This generation is graduating with the lowest rates of summer jobs since 1948. It’s up to their managers to orient these new hires not only to the job, but also to being an employee—including fundamentals of responsibilities, roles, and work culture. Don’t assume they know the unspoken rules of a workplace. In fact, consider offering a separate “Working 101” orientation for new employees of this generation. 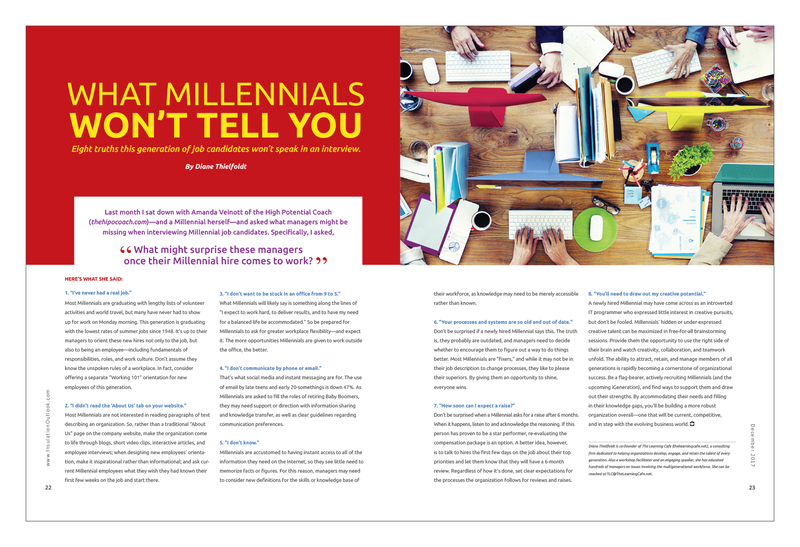 Most Millennials are not interested in reading paragraphs of text describing an organization. So, rather than a traditional “About Us” page on the company website, make the organization come to life through blogs, short video clips, interactive articles, and employee interviews; when designing new employees’ orientation, make it inspirational rather than informational; and ask current Millennial employees what they wish they had known their first few weeks on the job and start there. What Millennials will likely say is something along the lines of “I expect to work hard, to deliver results, and to have my need for a balanced life be accommodated.” So be prepared for Millennials to ask for greater workplace flexibility—and expect it. The more opportunities Millennials are given to work outside the office, the better. That’s what social media and instant messaging are for. The use of email by late teens and early 20-somethings is down 47%. 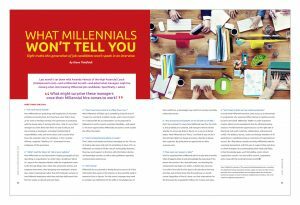 As Millennials are asked to fill the roles of retiring Baby Boomers, they may need support or direction with information sharing and knowledge transfer, as well as clear guidelines regarding communication preferences. Millennials are accustomed to having instant access to all of the information they need on the Internet, so they see little need to memorize facts or figures. For this reason, managers may need to consider new definitions for the skills or knowledge base of their workforce, as knowledge may need to be merely accessible rather than known. Don’t be surprised if a newly hired Millennial says this. The truth is, they probably are outdated, and managers need to decide whether to encourage them to figure out a way to do things better. Most Millennials are “fixers,” and while it may not be in their job description to change processes, they like to please their superiors. By giving them an opportunity to shine, everyone wins. Don’t be surprised when a Millennial asks for a raise after 6 months. When it happens, listen to and acknowledge the reasoning. If this person has proven to be a star performer, re-evaluating the compensation package is an option. A better idea, however, is to talk to hires the first few days on the job about their top priorities and let them know that they will have a 6-month review. Regardless of how it’s done, set clear expectations for the processes the organization follows for reviews and raises. in their knowledge gaps, you’ll be building a more robust organization overall—one that will be current, competitive, and in step with the evolving business world.